The global organic acids market was valued at US$ 8.0 Bn in 2017. 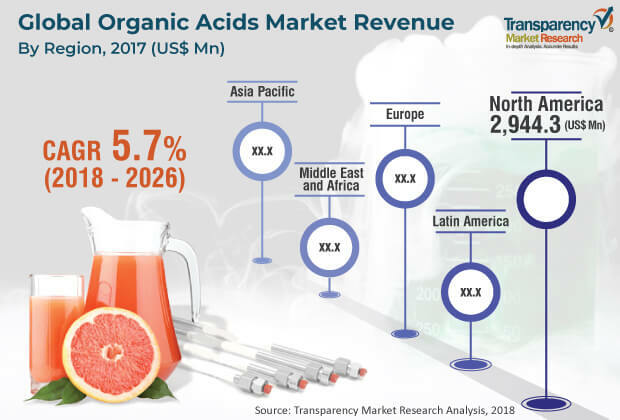 It is projected to expand at a CAGR of 5.7% from 2018 to 2026, according to a new report published by Transparency Market Research (TMR) titled ‘Organic Acids Market – Global Industry Analysis, Size, Share, Growth, Trends, and Forecast, 2018–2026.’ Expansion of the food & beverage industry is expected to augment the demand for organic acid from 2018 to 2026. Increase in population, changing lifestyle, and GDP growth are estimated to boost the global organic acids market from 2018 to 2026. Demand for organic acids is extremely dependent on the food & beverages sectors, which is a prominent end-use industry for organic acids. Moreover, an increase in population and GDP growth in region across the word are expected to boost demand for organic acids. Furthermore, expansion in the pharmaceuticals industry is anticipated to fuel demand for organic acids during the forecast period. Organic acids act as antioxidants, flavoring agents, and preservatives in the bakery, confectionery, dairy, beverage, and other food industries. Demand for organic acids from the food & beverage industry is projected to increase in the coming years. The global organic acid market has been segmented based on product type, application, and region. In terms of product type, the acetic acid segment held a major share of the global market in 2017. Acetic acid possesses antibacterial and antifungal properties, which are highly useful in food preservation. Thus, widespread consumption of acetic acid in the food & beverage industry is projected to augment the organic acid market during the forecast period. Furthermore, rise in demand for propionic acid from the pharmaceutical industry for the production of solvents and non-steroidal anti-inflammatory drugs is expected to fuel demand for organic acids. Moreover, citric acid is used as a flavoring agent in the beverage industry. Therefore, a rise in the production of beverages is expected to propel the organic acid market. In terms of application, the organic acid market has been segmented into bakery & confectionery, diary, beverages, poultry, meat, seafood, livestock feed, animal feed, pharmaceuticals, industrial, and others. The bakery & confectionery segment is projected to hold a major share of the global organic acid market during the forecast period. Organic acid is either naturally present in foods or is chemically synthesized and added, directly or indirectly, to food products. Some of it is formed during the fermentation of carbohydrates in foods. Organic acids are widely used as food additives and preservatives in order to avoid food deterioration and extend the shelf life of various food products. Thus, determining organic acid content in food products is important, since these compounds contribute to the flavor and aromatic properties. Besides this, organic acids can influence the preservation of foods and beverages. The organic acids market in Asia Pacific is likely to expand at a significant pace during the forecast period. A rise in population in China and India, changing lifestyle, and expansion in the food & beverage sectors are major factors driving demand for organic acids in Asia Pacific. Moreover, a Rise in urbanization in developing economies such as India, China, Vietnam, and Indonesia is expected to provide lucrative opportunities to food manufacturers to increase the production of packed food products, leading to higher consumption of preservatives. Additionally, high investments in the pharmaceutical sector and increase in the number of food manufacturers in the region are projected to provide lucrative opportunities to the organic acids market during the forecast period. The report provides profiles of leading players operating in the global metal roofing market such as Archer-Daniels-Midland Company, Cargill Incorporated, BASF S.E., BioAmber Inc, Genomatica, Inc., Henan Jindan Lactic Acid Technology Co., Ltd., Fuso Chemical Co., Ltd., Koninklijke DSM N.V., Celanese Corporation, Corbion, DowDuPont Inc., Eastman Chemical Company, Elekeiroz SA, LUXI Group, GC Innovation America, NatureWorks LLC, Polynt SpA, and Tate & Lyle. Key players are involved in partnerships, joint ventures, and collaborations with food & beverage and livestock feed manufactures, respectively, to meet the rising demand of organic acids.